Gardening is moving up to a whole new level; it has become a lot more easier and far more convenient because now it can easily be moved inside the house, and it can be far more stylish than it was years ago. Moreover, no more weekends spent pointlessly digging the ground when you haven’t even decided if you want to permanently place the plants there. All in all, gardening has changed thanks to the latest invention on the market: self-watering planters. They save you time, effort and unnecessary headaches from looking at some hideous planting pots you don’t even like. The self-watering planters are truly what most housewives (and men for that matter) needed so they can really enjoy gardening instead of seeing it as the ‘thing you need to spend your entire Saturday morning for’. 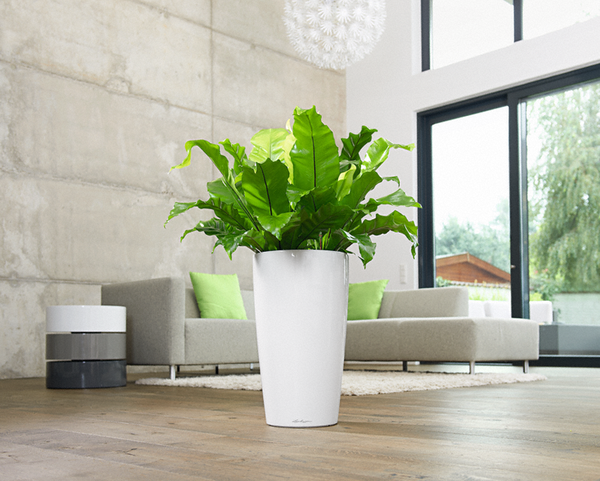 Although you can find them in many designs and colours, my personal favourite are the white planter pots online retailers offer; white colour to add sophistication and elegance to either your outdoor or indoor space, perfect sleek lines, great shape, various sizes and most importantly, designed perfectly for planting edible plants like veggies and herbs. As their name suggests, self-watering planter boxes water the plants for you; they come with a build-in reservoir for water, which you fill in (there’s a mark showing you exactly how much you need to put in the reservoir) and the plants afterwards simply take as much as they need through their roots. There’s another container for the soil and the plants; it’s positioned just above the water container so the root system takes the water it needs. Sometimes, the roots are very small, and you may think that you need to add water from the top of the soil so that it reaches the roots because they can’t reach the lower water container, but you’re wrong; these planters have a whole capillary web installed in them whose purpose is to carry the water to the roots and through the soil. So basically, you don’t need to do much to water your plants, you just need to make sure the water reservoir is full at all times. Fertilization is something you should pay attention to when planting in self-watering planters, as sometimes a salt build-up can happen. Because of naturally occurring minerals that can be found in water, and because water quickly evaporates leaving the minerals undissolved on the pot’s bottom, this salt build-up situation happens which can lead to plant failure and that is exactly why it is so important to use only water soluble fertilizers. Do not use liquid or time-release fertilizers in these pots. Also, do not try to fertilize from above or below after planting the plants. Since most types of veggies and herbs will require different fertilizers, it’s best that you get a dry granular fertilizer. And, never ever put the fertilizer in the water reservoir. Choose the compost wisely and mix it in the potting mix – compost is important because it helps the soil retain positive ion nutrients. If you have the time, it’s best that you make your own compost instead of buying it from the store, since a home-made one definitely has a lot more nutrients and other beneficial ingredients. Don’t forget to clean the planter at least once a year – at least once a year make sure you pour water over the planter and allow it to overflow the side hole. This will dissolve and flush out all the mineral build-up that’s left over in the containers. Also don’t forget to replace the potting mix – you can’t keep the same potting mix for all times and seasons; you need to add new, fresh soil every year so that your plants have a fresh dose of nutrients for growth and development. Bottom line, these stylish, surprisingly convenient self-watering planters are a really amazing invention; whether you choose to get a large one for your garden vegetables or your precious flowers, or you go for a smaller, mini one, the benefits are equally priceless; you have your life, your plants have theirs – everyone is happy.